Unlike the popular complaint against NCT, which is the 'unlimited' concept, the real issue resides in the communication between the marketer and consumer, which in this case, is SM and the fans. The 'concept' of NCT had received mixed reactions, some fans loving it for the uniqueness (Or simply being un-bothered by the idea of members being added continuously) and others disliking it (Or being uncertain about how this concept will work - or if it will work at all). But this isn't the issue or weakness of NCT, in fact, it could arguably be said to be an advantage. So what is the real issue with NCT? It's that SM isn't informing the public correctly about their plans. Why is this an issue? It's because SM is playing around with a group system that hasn't been done (successfully) before, the fans are left in uncertainty about what's next with NCT. All that the fans know, is that SM is planning to make NCT into a global project, but at what cost? NCT currently has 4 units, Dream, 127, U and WavyV. As I've mentioned in my previous thread, 'Are Inter-Company Groups the future of KPOP? ', the only permanent units are 127 and WavyV, the others don't have a permanent structure, why would SM do this? Well, if we go with the assumption that SM is attempting to also have the system of Inter-Company Groups, then the answer gets a little simpler. What SM is attempting, isn't just a few units here and there, SM is actually trying to create a structure of a company through multiple units being branded under one name, 'NCT'. There is never going to be an NCT, the members will always change and it will get to a point where doing something like, 'NCT 2018' will be impossible. Units like 'U' and 'Dream' are just temporary advertisement for new members, those units are there to prepare those members for a permanent slot within the NCT world, these units allow SM to be experimental without the fear of losing fans as 'it's just a unit'. Unlike with normal groups, where a change of concept may scare fans, NCTzens don't have the fear of NCT maintaining one specific concept because of the multitude of units that release songs which all have differing styles and concepts. This idea of multiple 'sub units' is very beneficial to SM. Currently SM's goal is something called, 'Globalisation by localisation' (thanks jyp). This is a system where groups (Or in this case, units), debut in specific countries, eg. WavyV, to attract fans from those countries. So, how is this different from just debuting a group? Well, WavyV and any future foreign sub-units will have the NCT association, so when those Sub-Units garner fans from their respective countries, the fans will be encouraged to check out the other sub units, or just NCT in itself. How? 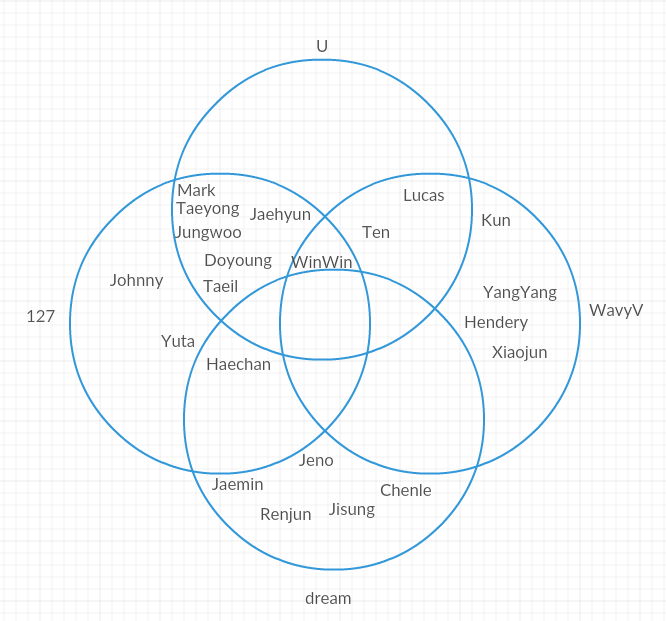 Through members like Lucas and Winwin, who are both in WavyV but are also part of the Korean units, SM hopes that by having members in multiple units, fans will feel obligated to check those units out and fall into the trap of liking more than just one unit, inevitably expanding to liking ALL of NCT. This idea is also very convenient for SM, as once NCT becomes even more expanded, it will allow for easier collaborations between artists. So, even if some members are not necessarily connected to other units, SM can easily create collaborations such as, 'Baby don't stop' or 'YestoDay' which will connect whichever members are participating in the collaboration and hopefully encouraging the fans to check the other members and their units out. SM doesn't expect us, as potential fans, to check out all the sub units at once. In fact, if you look at the units from a surface level, SM treats the sub units very much as their own groups, so that fans will be dragged in by one of the units, and eventually expand to the others. So the complaint about, 'too many members' truthfully isn't an issue. SM isn't forcing anyone to try to get into all the sub-units at once (And that's okay, you don't have to stan all of them, or even like all of them). However, if you stay around for long enough, you will be forced to like the other units whether you like it or not, all it takes is just one unit. I think that if SM communicated the idea of the Sub-Units being their own groups and NCT being a branding that just connects all of them, then there wouldn't really be any issues, especially with potential fans worrying about having to learn all the names. Anyway, do you think this idea will work?? Will it fail just like SJ and EXO originally failed? idk, time will tell, i think. And that's without WayV. If SM were to give clear explanation as to what their plans with NCT are (other than globalisation of Korean music) then people might show interest. If they keep "pulling an f(x)" by experimenting (unsuccessfully) we all know how that will end. I mean, it's all a learning process in the end, SJ had failed terribly in the regard of having a non-permanent lineup, but now NCT have exactly that but in a different system than what SM was planning with SJ. Though, EXO's failure wasn't really on the execution of it, but rather the treatment and mismatch for goals between the chinese members and SM itself. Everything that has happened in the past has been revised and done differently with NCT. I just hope that this time, the experiment wont be at the cost of anyone's career. I don't really mind the way that NCT functions currently, i just WISH that SM would finally announce it to the fans to take away the confusion instead of avoiding responsibility. They also need to make NCT into a company itself ASAP. WHich when you put it like that, doesn't actually look as confusing as it appears. It's just going to be overwhelming if you make yourself learn them at once. But I agree, they need to establish their plans to the public, otherwise it's just going to be too confusing and people will be pulled away rather than pulled in. Appreciation If these are the next Dreamies I am already in love! Discussion The real meaning behind Yes Or Yes.